To prevent accidental over-sharing, the user will see an animation when clicking the toggle switch that makes it clear that the permissions are being changed to allow the link to be shared with view access with those who will be receiving it. In addition, there is a confirmation message that appears on the screen, alerting users of the change in permissions, and giving them the option to easily undo it. Google Drive allows users to easily share files with collaborators through access control permissions and sharable links. 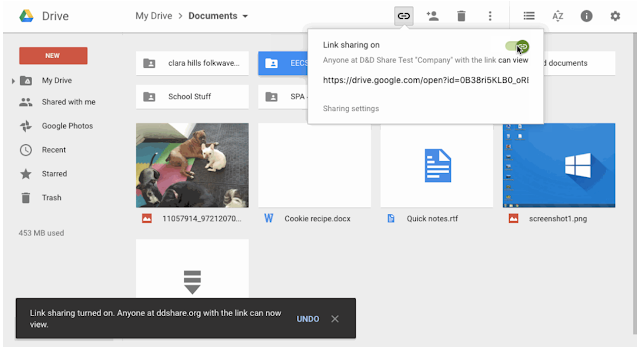 With this launch, we are making it even easier to turn on file sharing in Drive on the web. Just select a file and click on the “Get sharable link” icon on the top right-hand side menu. You’ll then have the option to turn on link sharing with one click on the toggle switch. * The sharing link will then be copied to the clipboard for easy distribution and will provide view access to anyone in your domain who receives the link.